Innovative, two-year pilot program provides critical capital and training for next generation of developers building communities of opportunity. Capital Impact Partners—with support from JPMorgan Chase & Co.—announced a new $5 million program committed to help more minority real estate developers participate in Detroit’s continued economic recovery by providing them with critical training opportunities and access to capital. The program will help 15-20 new minority developers help their businesses grow. As part of the firm’s $150 million investment in Detroit’s recovery, JPMorgan Chase has committed to a $500,000, two-year investment in Capital Impact’s Equitable Development Initiative. 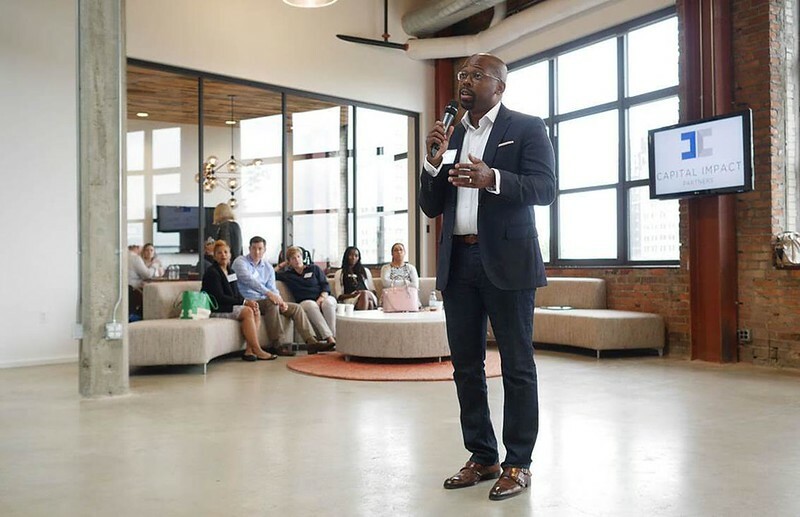 This program will provide a combination of catalytic capital, one-on-one mentorship with local experts, and formalized training to bolster inclusivity within Detroit’s real estate market. The two-year program is designed to kick-start the development of small- and mid-sized mixed-use, multi-family residential projects in the city’s mixed-use corridors and is aligned with Capital Impact’s mission—helping people build communities of opportunity that break barriers to success. Nationally and locally, minority developers are often underrepresented in the broader real estate development industry. In fact, Capital Impact realized of the $152 million it loaned in Detroit between 2006 and 2015, projects led by minority developers received approximately 1/10th of that financing. Together, Capital Impact, JPMorgan Chase and several other organizations critical to the introduction of the Equitable Development Initiative—including partners within Detroit’s CDFI community, city government and National Development Council—will support budding minority developers by providing them with mentorship, management training and low-cost capital to develop real estate projects in Detroit’s neighborhoods. The resources will help participants with project budgeting, real estate finance, project and contractor management, legal services and community engagement. There are approximately 50,000 minority-owned small businesses in Detroit, making it the fourth largest city for minority entrepreneurship. As the city’s recovery continues, more developers are needed for the rehabilitation and construction of housing in Detroit’s neighborhoods. Developers in this program will benefit from the loan funds JPMorgan Chase established with Capital Impact and Invest Detroit to finance mixed-use real estate, affordable multi-family housing, and commercial and retail developments in neighborhoods across the city. An example of this is the Coe Project in West Village, which is being led by minority developer Clifford Brown. The Coe is a 12-unit, mixed-use development with eight townhouses, four apartments and two small retail units, and is the first project of Detroit’s Strategic Neighborhood Fund. The project is supported by Capital Impact Partners, Invest Detroit, Broder & Sachse Real Estate and Sachse Construction. To be eligible for the Equitable Development Initiative, participants must be developers of color from the Detroit area with some real estate development experience. Priority will be given to developers planning a 6-20 residential unit, multi-family or mixed-use development located in strong corridors that align with the City of Detroit’s targeted redevelopment areas. Developers without a planned project will also be considered for the program. The two-year pilot phase of the Equitable Development Initiative will support up to 15-20 minority developers through training and mentorship; Capital Impact also plans to finance a subset of real estate development projects led by program participants over the next two years. Applications for the Equitable Development Initiative are available online (Opens Overlay). This latest investment by Capital Impact and JPMorgan Chase is in addition to the $30 million Detroit Neighborhoods Fund (Opens Overlay). The Detroit Neighborhoods Fund is capitalized through a $20 million investment by JPMorgan Chase and $10 million by Capital Impact to provide financing for multi-family residential properties, mixed-use real estate and grocery stores. For more information on Capital Impact, visit www.capitalimpact.org (Opens Overlay). For information on JPMorgan Chase’s ongoing revitalization efforts in Detroit, go to www.jpmorganchase.com/detroit.